Casa Samba ist die perfekte tropische Flucht Villa. Diese Villa mit 5 Schlafzimmern und 5 Bädern wurde in einen Bluff gebaut und überblickt den Regenwald mit weitem Blick auf den Pazifischen Ozean nahe dem weißen Sandstrand von Playa Espadilla. Es befindet sich in der exklusiven Nachbarschaft mit Kopfsteinpflaster am Pacific Canyon Drive, privat, aber leicht zu den lokalen Märkten, Restaurants, Spas und dem Manual Antonio National Park. Die Villa ist Multi-Level-Wohnräume alle offen für Meeresbrise und tropischen Gärten mit exotischen Klängen und Düften aus der lokalen Flora und Fauna. Dies ist nicht der typische Ferienvilla, die in aller Eile gebaut wurde eine schnelle Flip zu bekommen. Der Besitzer lebte mit seiner Familie in Casa Samba und kümmerte sich nicht um Details, um ein originelles und exquisit gestaltetes balinesisches Haus zu schaffen. Mit offenen Deckenbalken aus Bambus, handgeschnitzten Steinen und glasierten Steingutspülen, kundenspezifischem Mauerwerk und Fliesen, exotischen Harthölzern und Originalkunstwerken aus aller Welt. Pacific Canyon Drive ist eine private Wohngegend-off der Haupt Manuel Antonio Straße. Es ist eine Gemeinschaft von Expats gebaut, die den Komfort des modernen Luxus leben in einem tropischen Strand der Stadt wollten. Alle Annehmlichkeiten und Notwendigkeiten sind mit dem Bus, dem Taxi oder zu Fuß zur Verfügung. - 270-Grad-Blick auf den Pazifischen Ozean und den Nationalpark Manuel Antonio. Pool, Billardtisch, TV, DVD / CD-Player, Stereoanlage, Grill, Bademäntel mit riesigem Frottee, 100% Baumwollbettwäsche (Anzahl 350), herrliche Aussicht, Klimaanlage in den Schlafzimmern, Terrassen, Tropischer Garten, Tägliche Zimmerhälterin, Gärtner, Wäscheservice Verfügbarkeit, Concierge, Pack and Play, Hochstuhl, Safe im Zimmer, Kühlschrank, Mikrowelle, Mixer, Kaffeemaschine, Spülmaschine, Toaster, Backofen, Vollständiges Geschirr. Our family rented this home along with the property next door for a week. The property is located on top of the hill so you have lovely view and a breeze that cools things down during the warm part of the day. The pictures represent the property and the pool was an extra bonus. Valarie suggested we book Chief Junior to prepare our breakfast and dinner for the week. We had lovely meals and I wish I could have brought him and his assistant home with me. Our Grandchildren played in the pool until dinner was served and each night the food was special. Thankfully Valarie recommended booking a private driver for a van of eleven people from the airport to the home. That certainly made things stress free. We also book various tours with Valarie. The housekeeper comes six days a week so everything stayed nice in the house. The children enjoyed seeing the monkeys and one iguana came daily on the porch.. I recommend this property and I recommend you book Chief Junior and private driver and tours through Valarie. I will start by saying be prepared to walk some steps. Good news is that after a week in Casa Samba we didn’t gain a pound. That being said this house is magnificent. Every bit as gorgeous as the pictures and the view wasn’t done justice by the pictures. Every single morning the view of the Pacific took our breaths away. Prior to arrival Valerie could not have helpe any more than she did. Her recommendations were spot on and she made the entire vacation seem so easy and worry free before we ever landed in Costa Rica. Once there Gary was more than happy to help, whether get someone to translate, recommend a restaurant, or arrange transportation. Roxie, while I never saw her, I also never had to worry about towels, clothes, or anything else around the house. Chef Junior cooked the most fantastic meal I’ve ever had. We called to tell him that we had caught enough fish to feed everyone the day before and he seemed genuinely excited to cook thenfish for us. That meal will never be forgotten. It was fabulous. The entire team was the icing on the cake that was a beautiful house. I would truly have to search for something to complain about. Daily visits from the monkeys were a highlight as was the sloth in the tree above our deck. The pool was clean and cool which was nice after a long day in the heat and humidity. I understand the allure of the infinity loom to a pool in a mountain but it was a tad unnerving for this father of three young boys. For me I’d like to see some sort of optional/ removable retaining system installed either below the wall or along the ledge. 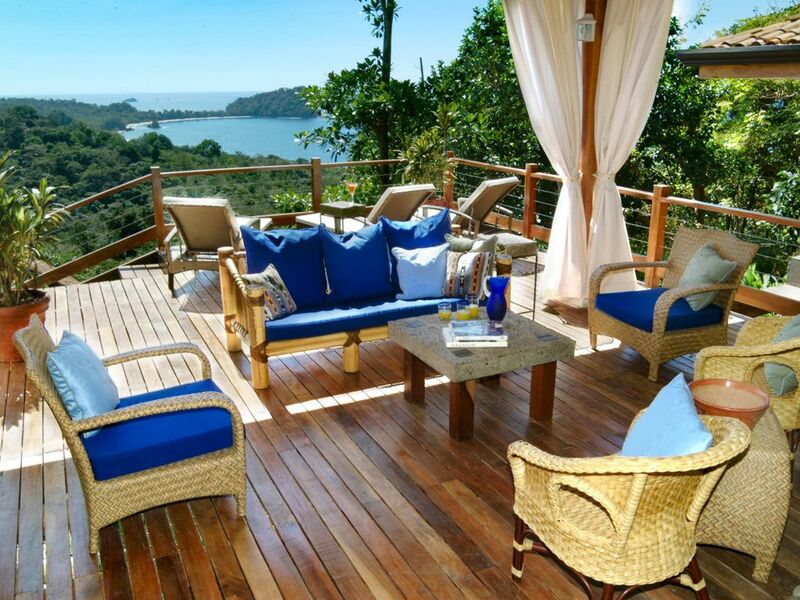 As for recommendations, I’ve already recommended this house to 4 friends who are planning on traveling to Costa Rica. Hello to Dean and the rest of your group. Thank you very much for the amazing reviews and recommendations, it is guests like you that help us keep going here in Costa Rica. We hope to help you on any future trips and are more than happy top help your friends with any vacation needs they have. Thank you from everyone here at Escape Villas Costa Rica! Wonderful way to experience Costa Rica! The house was beautiful and clean. All Escape Villas staff were exceptional. We enjoyed hanging out at the house so much...outside living area big enough for all in our 10 person group to congregate, large dining area, beautiful pool, views to die for, plenty of wildlife to view right at the house (lovely landscape, iguanas, basilisk lizards, geckos, agouti, giant moths, beautiful butterflies, cicadas and daily visits from the capuchin monkeys with less frequent visits by howler monkeys). The upstairs living space with pool table was a favorite place to view the hilarious antics of the monkeys and nightly lightening storms. Escape Villas booked all of our activities with high quality tour guides (horseback riding, ATV tour, National Park tour, snorkeling). This is my second stay at an Escape Villas property in Manuel Antonio and I would highly recommend to others. It was so awesome to have you back with us for your visit to Casa Samba. We enjoyed having your family and friends and the entire Escape Villas staff appreciates your compliments about the service. Samba is truly the monkey house and no doubt they never seem to disappoint. We are looking forward to seeing you again. Pura Vida! Casa Samba is truly a tropical paradise. Our stay was near perfect and we would return in a heartbeat. The house and property are spectacular with beautiful views and within walking distance to town. The monkeys paid daily visits to us and birds and iguanas were also frequent visitors. Casa Samba is well maintained with almost every amenity we needed. Although laundry service is available, it would have been nice to have access to the clothes dryer as the humidity kept our clothes damp and bathing suits never dried out., but that was the only missing need. Everyone from the booking to checkout was wonderful to work with and Monica, our housekeeper was superb. Well-kept, amazing view and wonderful vacation! This place was one of the best places we have ever been. The daily cleaning service was wonderful and the house had a great layout, as well as a beautiful view of the ocean! Would highly recommend this house for families or friends! Stunning views with nature up close! Great place to stay! Sweeping views of the ocean and MA park, lots of visiting monkeys and iguanas, beautiful, fragrant landscaping...My husband and I stayed in the little cottage attached to the deck. It had a wonderful outdoor(ish) shower and a large window that opened to a jungle scene - birds and animals would visit - mot mot birds, wood rails and hummingbirds would get close without seeing us. Also saw an agouti roaming around. The house is well-kept and cleaned everyday. The upper deck pavilion is great for watching thunderstorms roll in. A slice of heaven for sure!